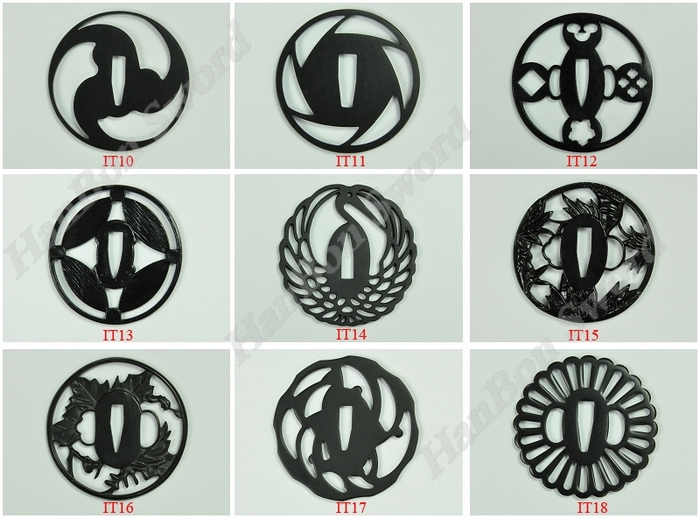 * If you want change the original blade, please contact with us first, because this picture showing are different blades which may need extra costs. Notice:Some countries such as Italy, Germany, UK, Spain, Brazil may charge customer customs tax, we can write a low price on package, but DO NOT take the responsibility for it. This sword is hand forged and hand sharpened using Japanese methods to create a perfect blade. Fully functional and battle ready. The accessories of the sword are all authentic from the ray skin handle, to silk sage-o and copper oxidized fittings. This is the best sword you will find in the price range. BLADE: The blade of the sword has been hand forged using the ancient method of sword making. Full hand forged, hand polished. This sword is made of folded steel with 13 times folding to create the 8192 layers, which cast flexibility and hardness of the blade in a large degree. The visible tenuous undulating grain on the blade was resulted from folded repeatedly during forging. The steel has been throughly refined and tempered, A special clay is applied to the blade by hand, using a thin covering near the edge and a thicker layer over the rest of the blade. this results in a relatively quicker cooling of the edge during quenching, producing a hard edge and softer back. the beautiful real hamon on the blade is also result of the differential cooling of the blade (quenching and tempering). This blade has no bo-hi to (blood groove) enhance its strength and cutting power. This blade has been hand polished with multiple grade sharpen stone by Japanese method, which made the surface of the blade like a mirror, the blade is also very sharp. 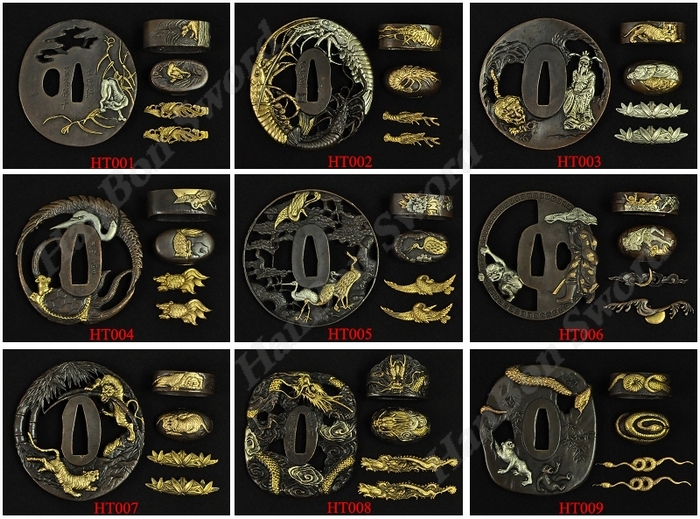 TSUBA:The Tsuba (guard) of the sword is made of brass. The Habaki (blade collar) is a one piece brass construction. Two Seppas (spacer) secure the Tsuba. TSUKA:The Tsuka (handle) core is wooden and it is tightly wrapped over genuine Ray skin Samegawa with synthetic silk Ito. 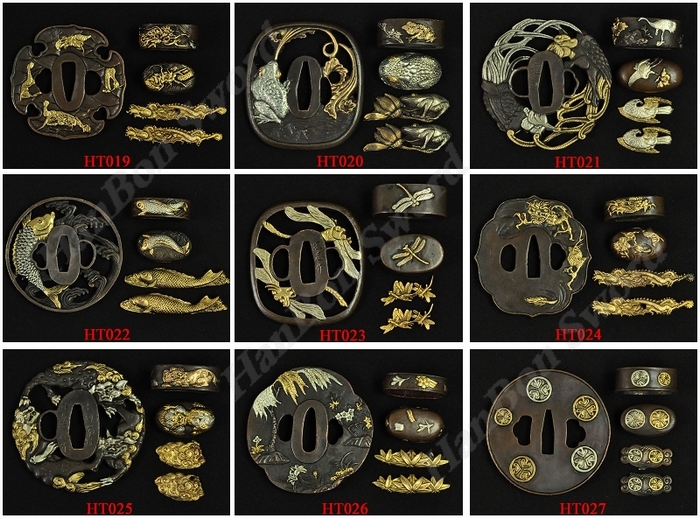 The Fuchi (sleeve) and Kashira (buttcap) are made of brass. The Tang of the sword is secured by two Mekugi (peg). Two copper Menuki (ornament) are on each side of the Tsuka. SAYA:The saya (sheath) of the sword is hard wood. Sage-O has been tied around the bright copper Kurigaga (knob) of the scabbard. The Koiguchi has been hardened. This is a super, truly samurai sword very suitable for iaido and kendo superior. 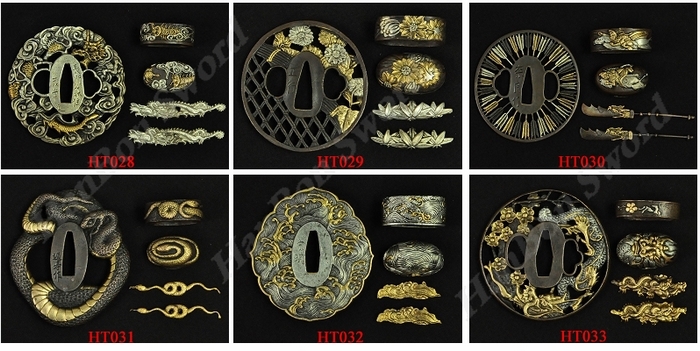 It is also allows you to make a collection of realistic, yet beautiful samurai sword, or to present one to your friend. Don\'t miss such a chance! NOTE: (1) The sword is well assembled with saya and free silk SWORD BAG. (2) If you need one wooden stand, please contact us, we will give you for free, we hope you just provide us with the additional $12 for shipping. Click HERE to get the wooden stand! (3) This Katana can be taken apart fully anytime for maintenance purposes, you can disassemble the sword from the handle by taking out two pegs. (4) Due to our swords are full hand made, so Specs will vary slightly from sword to sword. Please understand. Do you want a unique sword? Here you can get whatever you want. All our standard blades are available with customizable parts, where you can choose from a large array of fittings, Ito, Sageo and Saya. It is free to choose following parts instead of original ones! NO EXTRA CHARGES! We also can engrave your name, simple symbol or something else you like on the blade, it is also free!!! 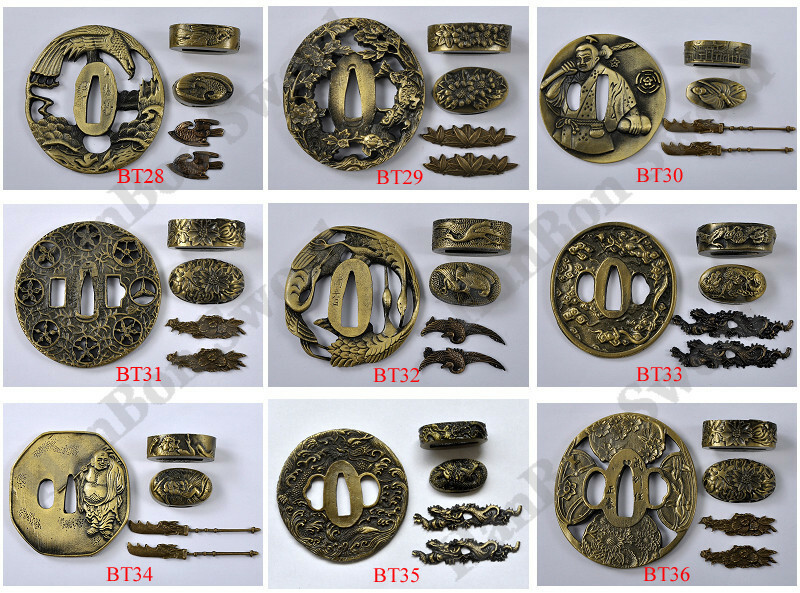 If you need to change some parts, please send me a message through your Aliexpress messaging system before or after you purchase, sword will be made according to your requirements. (1) HI (blood groove): NO-HI blade is more stronger for cutting, BO-HI blade is more lighter for practice. (2) Sharpness: All my blades are available in sharp or unsharp, please contact us if you need an unsharpened blade. (3) Sword Set: We can make a Wakizashi (medium) and a Tanto (short) to match this katana sword. NOTE:* Our blades are all FULL TANG blades, we have no any shortened Tang blades. * Our blades are all full handmade, if you need to customize the blade, please give us enough time to make it, as we all known"Soft fire makes sweet malt." * We have no any FAKE or MACHINE-MADE hamon blades; Our blades with hamon are result of differentiated hardening with clay, they are real hamon, WE DO NOT MAKE ANY FACK OR MACHINE-MADE HAMON ON THE BLADE. 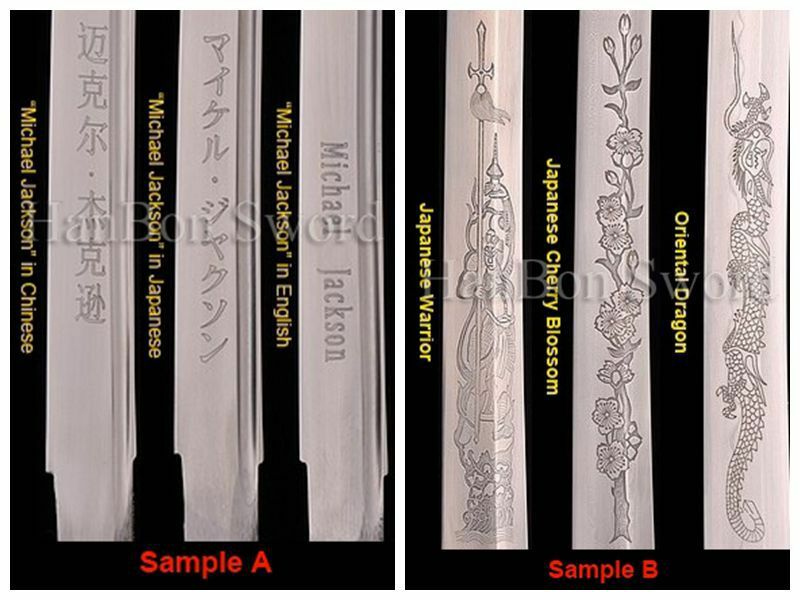 *We can engrave Chinese characters, English letters or Japanese kanji on the blade by engraving machine, it is FREE! please see the Sample A. *We also can engrave simple logo or something else you like on the blade by etching. You need pay an additional $20, and we need about one week to complete it. please see the Sample B. * Usually, we would engrave the name or logo on the blade toward the handle. We also can engrave your name on the Nakago (Tang). It is not a problem to engrave in other locations on the blade. * If you want us to engrave your name in Japanese, please translate your name into Japanese first, then send your Japanese name to us via aliexpress message system. * The blades with blood groove are not suitable for big images\' engraving. 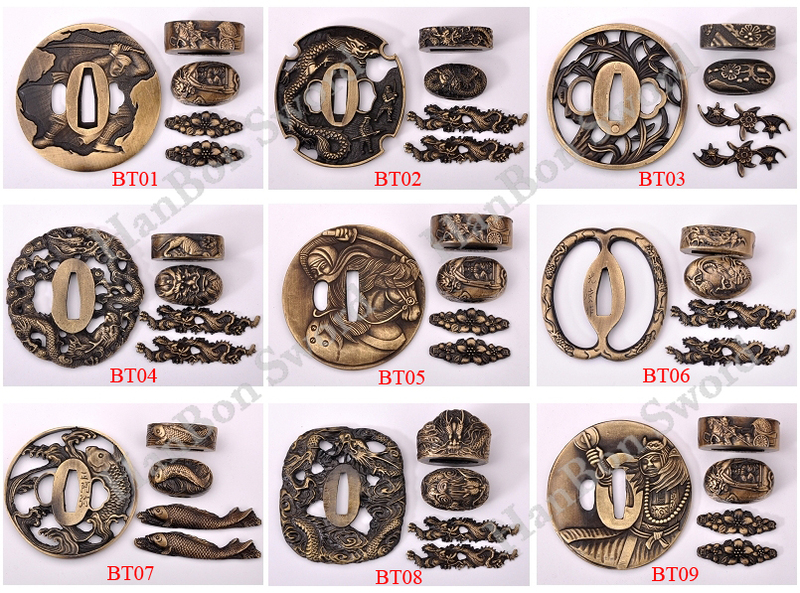 * Engraving by machine can be completed within 2 days; Engraving by etching need 3-5 days to complete. The "rayskin" (sometimes called shagreen) is actually fish skin taken from specific species of stingray or shark. It has been used on Japanese Sword handles for a very long time mostly due to its rough texture which when wrapped with \'cord\', denies the cord from slipping. 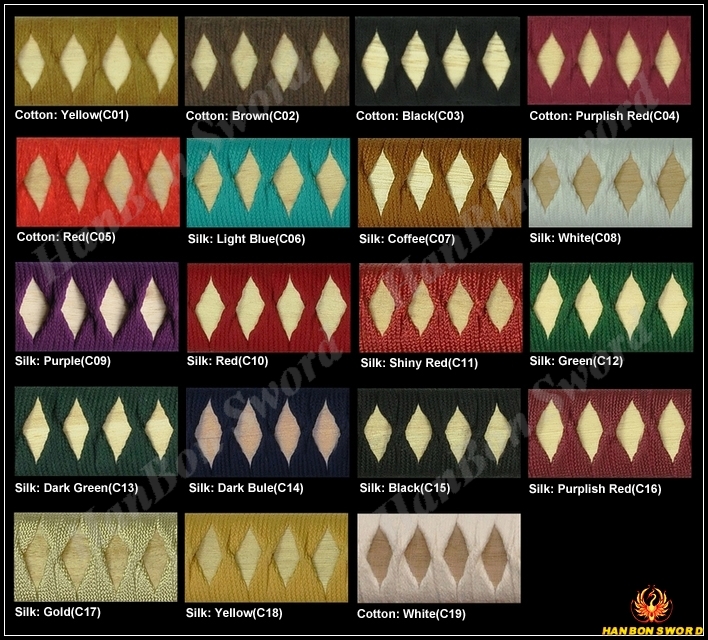 We have six colors for choosing, if you do not like the color on the above sword, you are free to choose following colors instead of original one! 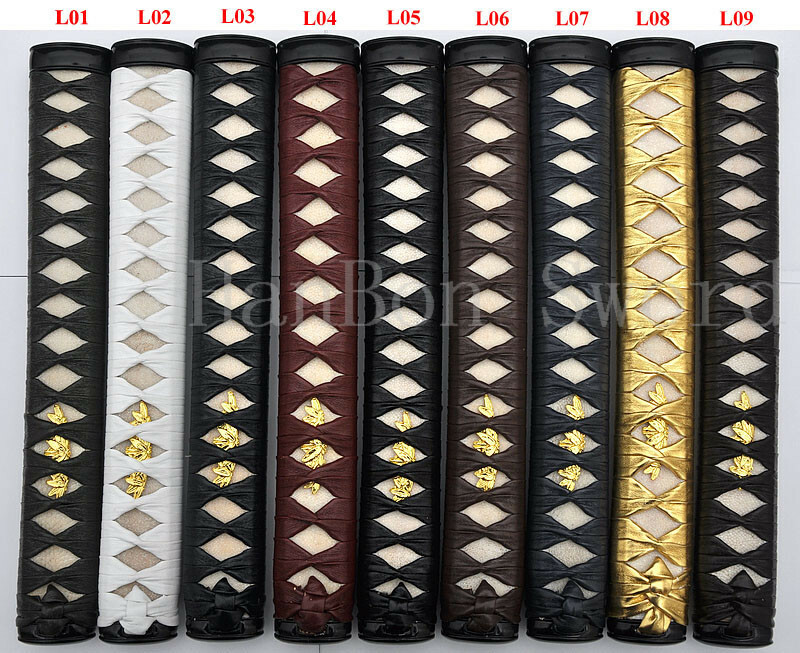 TSUKA-ITO is the cord wrap on the handles of Japanese swords. Its purpose is both aesthetic and functional, Ito comes in a wide array of color to suit every taste, and it helps reinforce the tsuka and prevent failure. You can choose following Tsuka-Ito instead of original one. 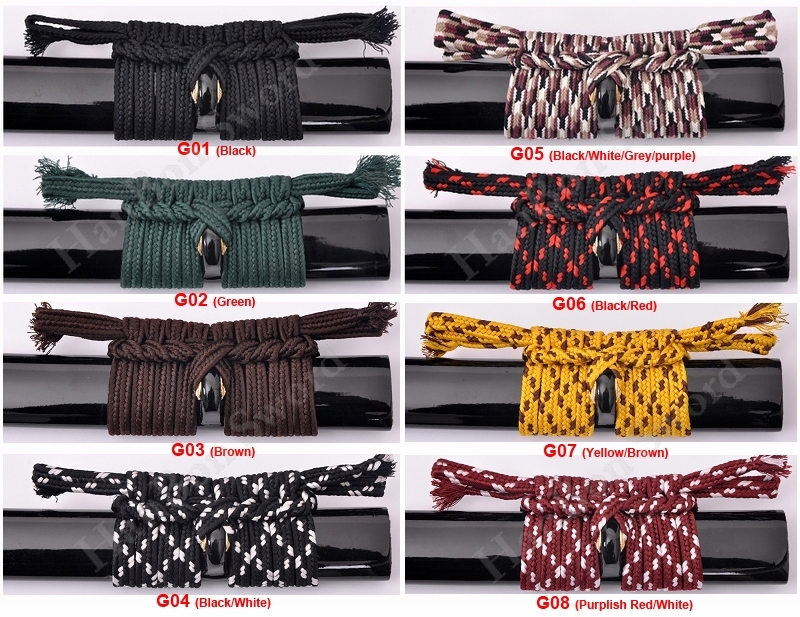 NOTE:If you choose the Tsuka-ITO here, in order to match Tsuka-ITO, we will choose same color for sageo, you also can upgrade the sageo by choosing below imported sageo. The Sageo have been used on Japanese swords for many centuries. The purpose of the Sageo is to hold the scabbard into the obi belt and keep it from slipping. It is also used at times to secure the katana into its saya by wrapping the sageo around the tsuka and tying it off. It is easy to customize your Japanese sword by swapping out the Sageo. 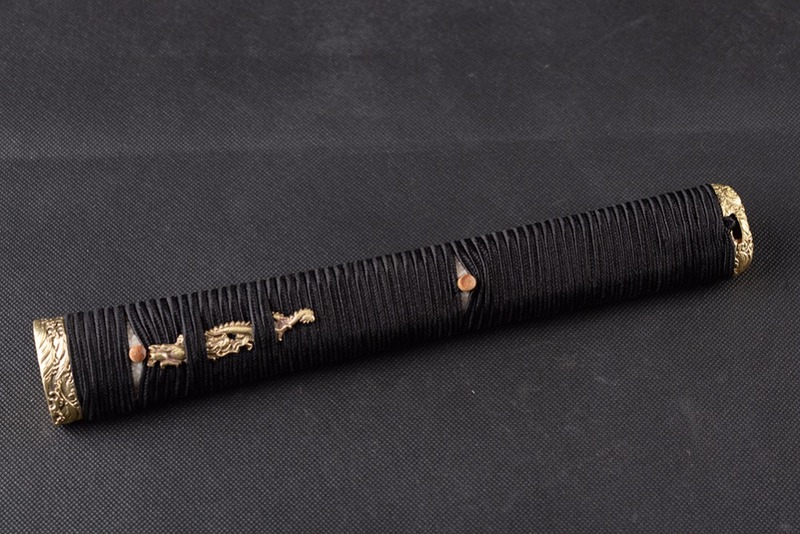 Tsuka-maki - the art of wrapping the tsuka, including the most common hineri-maki and katate-maki (battle wrap); You can choose the warpping between them, our focus is making the wrap as tight as possible to keep if functional as long as possible. The saya is a wooden scabbard for the blade; traditionally done in lacquered wood. Our saya are manufactured from very dry wood, they are not can keep the shape of the saya, but also can ensure the blade is not easy to rust. The below pics just show top part of saya, you are free to choose following saya instead of the original saya. There are many high quality SAYA for available, each Saya is fitted with genuine Water Buffalo HornKurikata, KoiguchiandKojiri. You can upgrade the saya for an addtional $45. *S17-S19 are made of hard wood and lacquered with speckle. 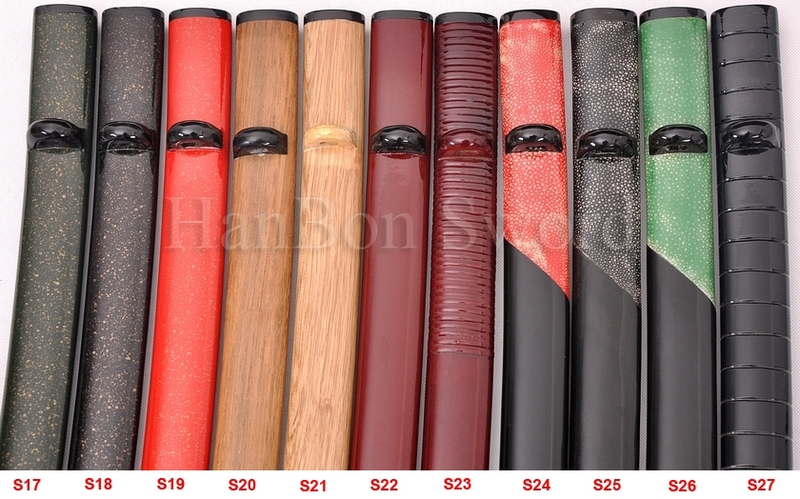 *S20-S21 are natural wood Saya, S20 is Hualee wood, S21 is hard wood with polished lacquer. *S23 is rattan-covered saya. features Rattan covering on the Koiguchi area, and lacquered. *S24-S26areSame\'coveredSaya,the Same\' (ray skin )has been sanded smooth and filled with polished lacquer. 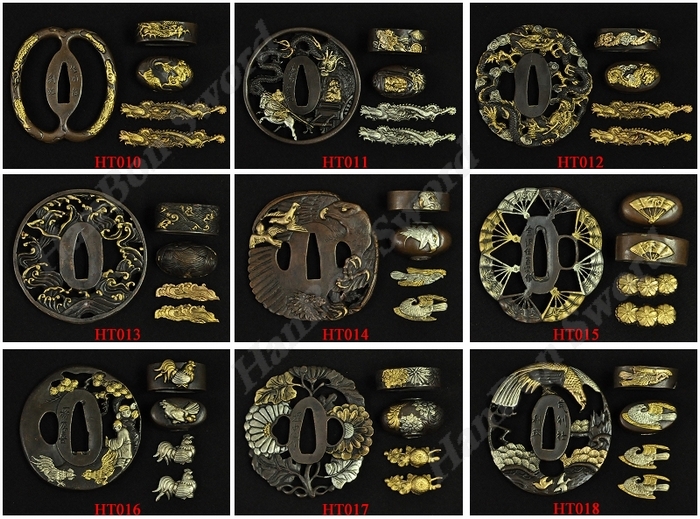 *S27 is hand-carved multiple ring-shaped SAYA, it is available with different colors. 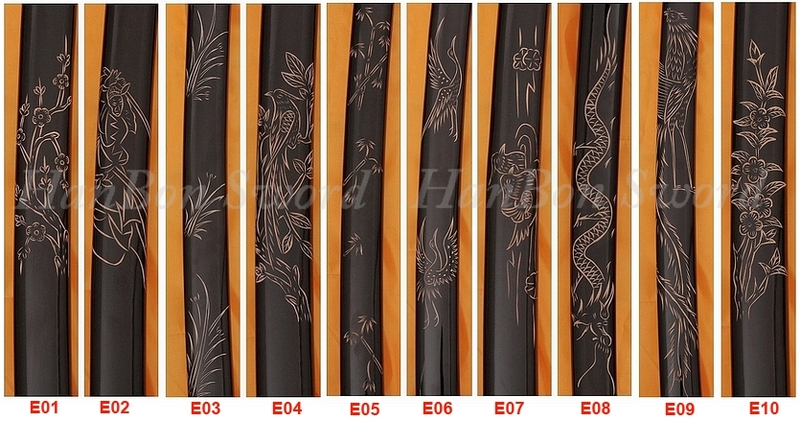 * We can make engraving on the SAYA(scabbard), following samples are fully traditional HAND-CARVED. 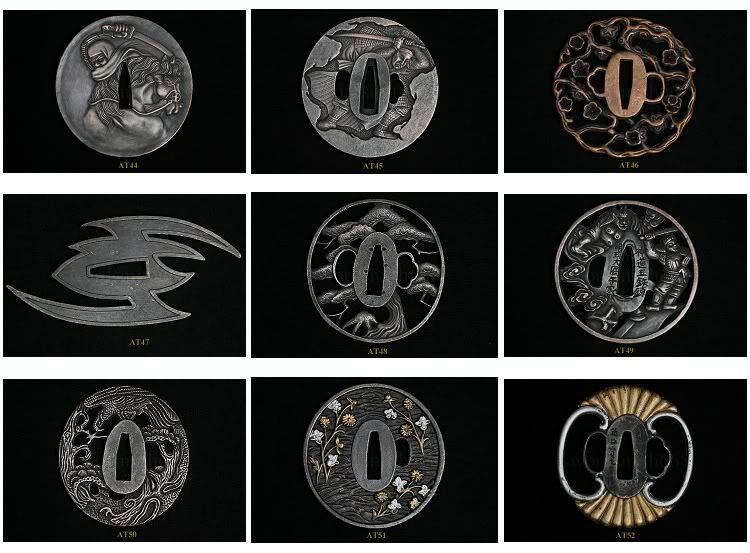 * The following engravings are available with different color SAYA. 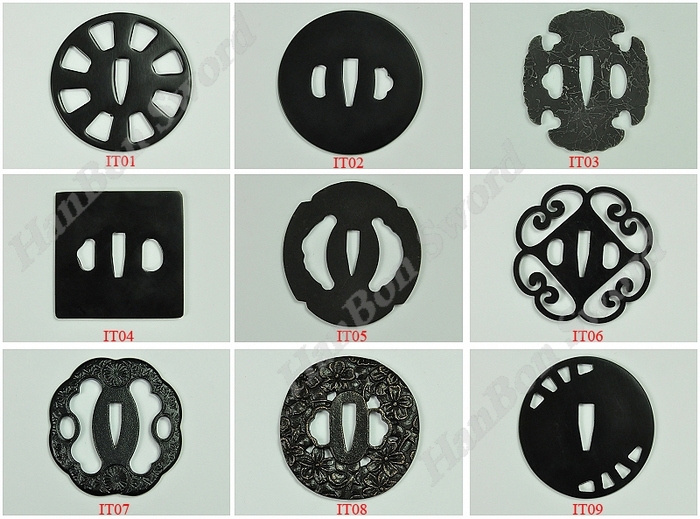 TSUBA is usually a round or occasionally squarish guard at the end of the grip of bladed Japanese weapons, like the katana and its various declinations, tachi, wakizashi, tanto etc. They contribute to the balance of the weapon and to the protection of the hand. The tsuba was mostly meant to be used to prevent the hand from sliding onto the blade during thrusts as opposed to protecting from an opponent\'s blade. 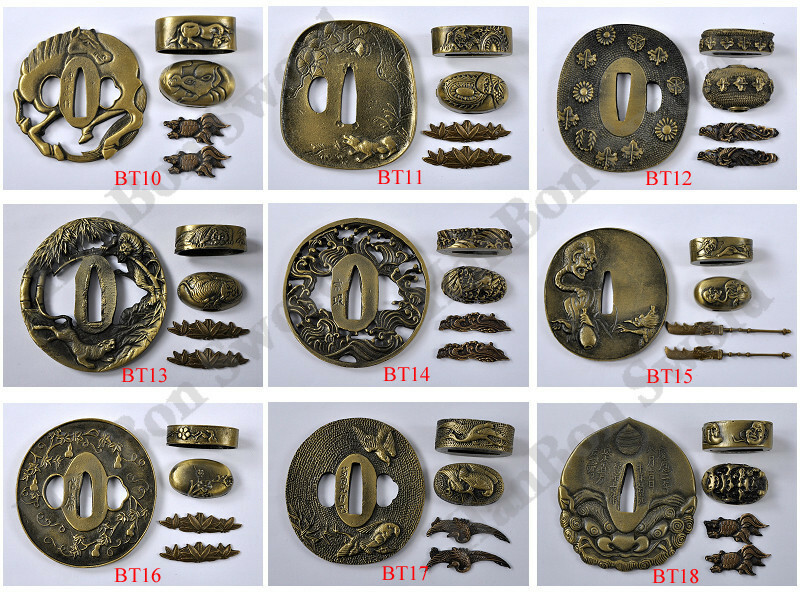 We have about 200 kinds of tsuba, they can be roughly divided into four groups, ALLOY TSUBA, IRON TSUBA, BRASS TSUBA and HIGH QUALITY BRASS TSUBA. 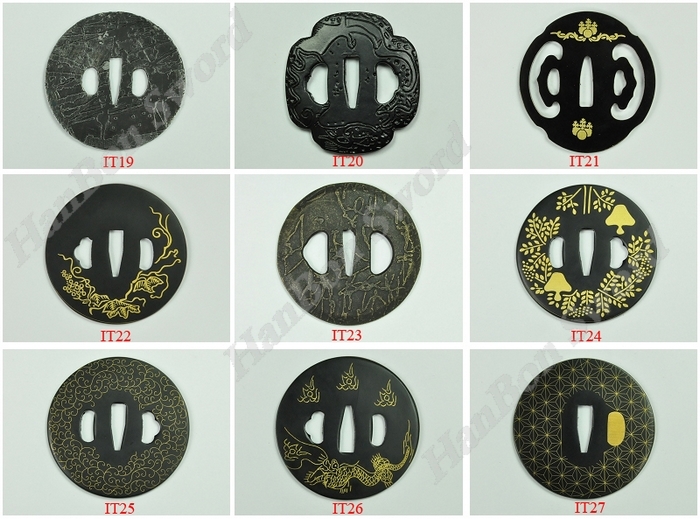 You can choose following Tsuba instead of original one. Why Buy From Hanbon Forge ? We are one of sword manufacturer in Long Quan China where is famous for sword making, All items selling on aliexpress are brand new from our factory. 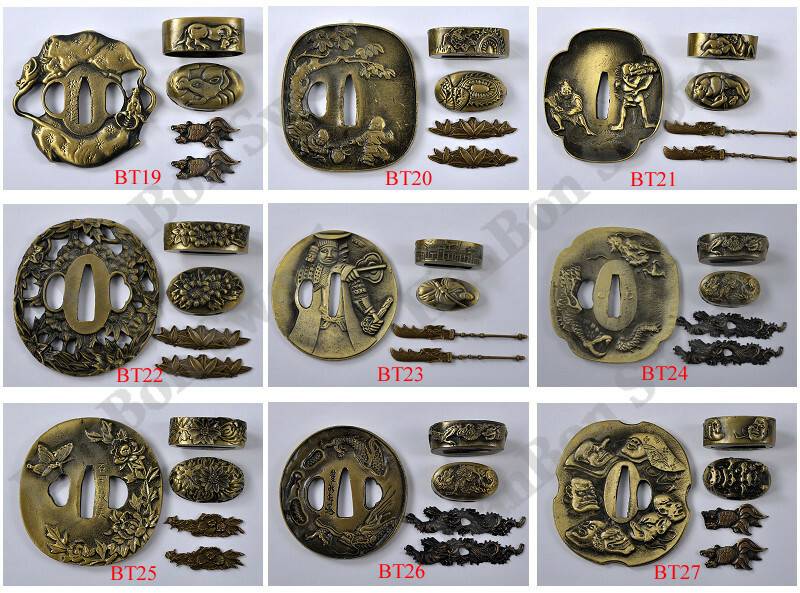 We are selling HANDMADE Chinese swords, Japanese swords and other crafts. We\'ll try to provide you with the great service and the best prices! 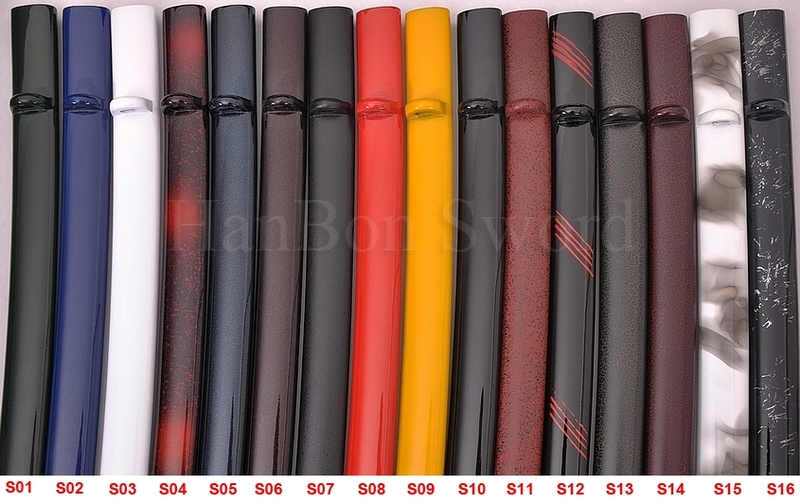 We are not reseller, we are sword manufacturer, all the swords are from our factory, we are selling manufacturer price. We have many sword smiths in our factory, whose techniques are very exquisite. We GUARANTEE that our my swords are full hand forged, hand polished and hand sharpened, the quality is very great. We have large selection of Japanese swords and Chinese swords available online, most of them in stock and ready to ship. For Japanese swords, we have near all kind of Japanese swords, such as KATANA swords, WAKIZASHI swords, TANTO swords, NAGINATA swords, NINJA swords, SAKABATO swords and so on; For the Chinese swords, we have Chinese sword "DAO" and "JIAN". Here you can find what you want!!! All our standard blades are available with customizable parts, where you can choose from a large array of fittings, Ito, Sageo, Saya and other options. we also can customize the blades for you if you give us detailed specifications, in addition, in order to make your sword more unique, we can engrave your name, simple symbol or something else you like on the blade. one word, we can customize ANY blades you like!!! Usually, we will ship your items within 1-2 business days, and we will use thick foam box to pack your swords, so please do not worry about long-distance transport. Once the item is shipped out, we will send an email with tracking number to you via aliexpress messaging system, you can tracking your package any time. At the same time, we will keep tracking the status of your item until you receive the package. * We accept Alipay, West Union, TT. All major credit cards are accepted through secure payment processor ESCROW. * Payment must be made within 3 days of order. *Payment must be received within 10days after notification of total payment due. Unpaid auction wins will be forfeited and will be reported to aliexpress. *If you can\'t checkout immediately after auction close, please wait for a few minutes and retry Payments must be completed within 3 days. * We can ship items to following countires: USA, Canada, Australia, Brazil, Thailand, HongKong, Austria, Belgium, Finland, France, Germany, Ireland, Luxembourg, Malta, Norway, Portugal, Spain, Sweden, Switzerland, UK and so on. * Buyers from United States, Australia and Canada, Please do not worry about CUSTOMS, we can ship swords to you without any problem. NO need any permit. *Customer from some European Countries such as GermanyandItaly need to pay Custom duties. * We can ship swords to most of countries, such as Argentina, Poland, Czech, Peru, Mexico, Ukraine, Hungary, Israel, Jordan, Bulgaria, Estonia, Kuwait, Croatia, Romania and so on, please contact us before you purchase. * Usually most of items are shipped within 2-3 days upon payment verification. * Customized swords are shipped within 3-5 days. Special customized sword may need more time. * We will only ship your order to the address that we received from aliexpress. If you need to change the shipping address, please contact us before item shipped. * A tracking number will be sent to you through aliexpress messaging system after your item was shipped. * Full shipping is charged for the first item and 25% off postage for each additional item if you purchase more than 1 item. * We do combine shipping. Please contact us to obtain correct rate charge before you pay, we will adjust it for you. * You must be over 18 years to purchase our swords. * Please contact us to fix the problem before leaving a negative feedback (Negative feedback can\'t solve any problem). We will do whatever reasonable to resolve your problem as long as we are given the opportunity. * Buyer can claim return items if our items are not as described after received items during 5 days.